Grey's Anatomy Recap: VA-GI-NA in "Bend and Break"
Note: Do not read on if you have not seen Season 11, Episode 5 of ABC's Grey's Anatomy, titled "Bend and Break." I have an unpopular opinion to share and if you've read my "Grey's" recaps last year you might know what I'm about to say: I've wanted Callie and Arizona to break up so badly. If they were real people and I knew them (which of course, I do) I would have counseled that breakup long ago. It's just humane: they aren't nice to each other, like ever. Someone is always giving up so much to make the other happy. Like Callie says, the thing that kills you is trying too hard to make a relationship work. And, quite frankly, I think Callie is mean and selfish. I think Arizona is a brat, too, and don't think that watching her try to "consciously uncouple" didn't remind me that I used to want to beat my ex-boyfriend and couples counselor with a broom (who needs space?! ), but I think Callie is the worst of the worst. That's why she's a good surgeon, like Yang and Meredith, she doesn't care if you like her or not. 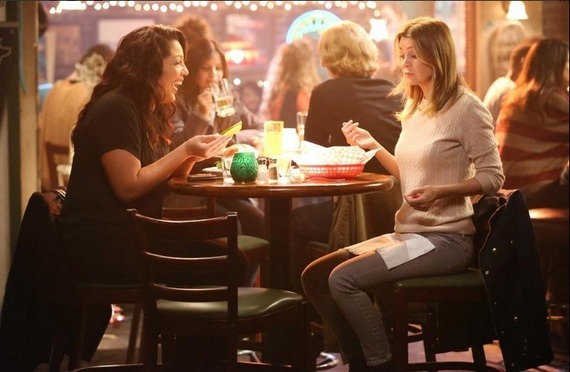 Watching Meredith and Callie get drunk though? Entirely amusing. It makes sense that two people who need to not go home could put their misery to good use. More amusing? How badass Geena Davis is as a boss. I hope they put her to good use (and let her use more baseball metaphors, because she makes me want to watch League of Their Own, always. Greys Anatomy is rocking these flashbacks the past two episodes. "Grey's Anatomy" airs Thursdays at 8 p.m. ET on ABC.